Bonsai are pruned on a regular basis so they keep their diminutive size. Without pruning, their natural apically dominant growth habit will take over; the upper and outer branches and shoots will extend strongly at the expense of the inner and lower growth, that could eventually dieback. Without the restriction at the roots in the confines of a bonsai pot, the tree would theoretically grow to a natural height. It is therefore important that growth is restrained. Unpruned upper branches can quickly lose their taper and delicacy, and in time, can become coarse and too thick for their position at the top of the trunk. However, there is a balance that must be struck. A bonsai must be allowed to grow. New growth is not only a sign of a healthy plant (and therefore a healthy bonsai) but in turn it generates a refreshing of the tree's structure, new root growth and vitality. Therefore a bonsai must be allowed periods of growth, periods of time where it is allowed to grow; enough to revitalise its energy but not so much that growth becomes coarse or the shape of the tree is completely lost and apical dominance is allowed to take over. A bonsai that is continually trimmed without respite will be continually regenerating new buds and shoots; the repeated production of these new buds deplete the energy reserves of a tree when it is unable to recoup its lost energy levels by means of photosynthesis. It must be realised that it is a myth to think that bonsai should and must be trimmed on a daily or weekly basis. It is also a myth to think that great bonsai look perfect all year round. 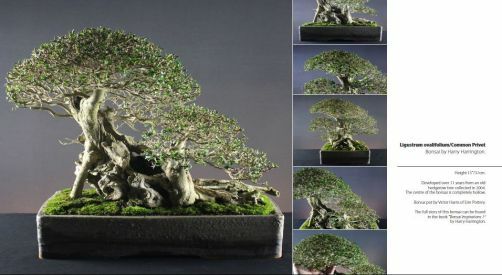 Most bonsai are exhibited, photographed and displayed in perfect condition but this state is only temporary. These same trees are allowed (or should be allowed) periods of the necessary free growth to allow shoot extension and therefore re-energise the tree; the perfect image is temporarily lost.